NASA is expected to announce a new discovery by researchers using the Hubble Space Telescope on Wednesday (Jan. 26). The space agency has scheduled a teleconference with reporters for 1 p.m. EST (1800 GMT) on Wednesday to announce and discuss the finding, which will also be published that day in the journal Nature. 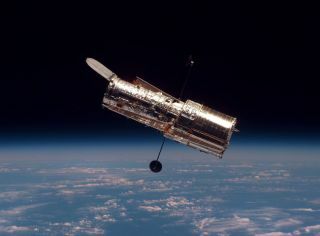 "Astronomers have pushed the Hubble Space Telescope to its limits and have seen further back in time than ever before," NASA said in an announcement posted on its website today (Jan. 21). Audio of the teleconference will be streamed live on the space agency's website, according to NASA's announcement. The briefing coincides with research that will be released by the science journal Nature on Wednesday, the space agency said. Eric Smith, Hubble Space Telescope and James Webb Space Telescope program scientist, NASA Headquarters, Washington, D.C. The Hubble Space Telescope, a joint effort between NASA and the European Space Agency, launched in April 1990. In the two decades since, Hubble has revolutionized the way humanity views the cosmos. For astronomers and laymen alike, Hubble's images have also helped bring the wonders of the cosmos closer. The telescope has been repaired five times over its long life, but it's expected to keep going strong until at least 2014.